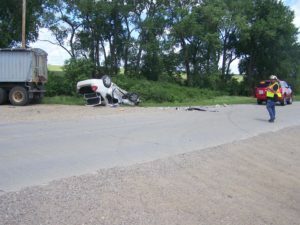 A teenage driver was killed and two other children were badly hurt in a two-vehicle crash Thursday afternoon in northwest Iowa. The Plymouth County Sheriff’s Office is reporting 16-year-old Daisy Pippet of Le Mars has died from injuries suffered from the accident. Pippet was the driver of the Chevy Malibu that failed to make a stop and consequently was struck broadside by a straight truck. Two other passengers were in the Pippet vehicle, a three-year old boy and a five-year old girl. Both were airlifted to a Sioux Falls, South Dakota hospital where they remain in critical condition. The driver of the straight truck and his passenger suffered only minor injuries during the accident.